If the tech industry wants another wave of innovation to match the PC or the internet, Google and Facebook must be broken up, journalist and film producer Jonathan Taplin told an audience at University College London's Faculty of Law this week. He was speaking at an event titled Crisis in Copyright Policy: How the digital monopolies have cornered culture and what it means for all of us, where he credited the clampers put on Bell then IBM for helping to create the PC industry and the internet. The Director Emeritus of the Annenburg Innovation Lab at the University of Southern California also wrote the book Move Fast and Break Things, a surprise bestseller. Plenty of "the internet is awful" books have come and gone over the past decade but Taplin's experience captured the post-Trump mood, which has turned strongly against Silicon Valley's giant internet platforms this year. Taplin's experience is the difference: it's vast and varied. Over the years he's been Bob Dylan's manager, produced the movies Mean Streets and The Last Waltz, and in 1997 launched the first ever VoD startup Intertainer, from which he knows a bit about antitrust. When Sony, one of his VoD company's shareholders, teamed up with Hollywood studios Warner and Universal to launch a copycat service called Movielink, Taplin filed an antitrust lawsuit. Could Bill Gates write code? "Defendants conspired and combined to fix prices, organized a group boycott of Intertainer, reneged on their licensing agreements with Intertainer and otherwise tried (and continue to try) to destroy Intertainer's viability," it alleged. Intertainer closed down. Four years later Taplin reached a financial settlement. He'd already annoyed the movie industry by testifying against DRM laws – but this ensured he would never work in Hollywood again. Taplin told his audience that he'd been moved by the fate of his friend Levon Helm, The Band's drummer, who was forced to go back on the road in his sixties, after radiation therapy for cancer. Helm died broke. Today, Taplin points out, YouTube accounts for 57 per cent of all songs streamed over the internet, but thanks to a loophole returns just 13.5 per cent of revenue. "That's not a willing buyer-seller relationship", he said, referring to the UGC loophole that Google enjoys, one not available to Spotify or Apple Music. But it isn't just songwriters and musicians who are poorly paid. The average person "works for two hours a day for Mark Zuckerberg" generating a data profile. Taplin pointed out that Bell held patents on many technologies including the transistor, the laser and the solar cell, that it agreed to license, royalty free, as part of a 1956 consent decree. "As a consequence, 7,820 patents or 1.3 per cent of all unexpired US patents in a wide range of fields became freely available in 1956. Most of these patents covered technologies from the Bell Laboratories, the research subsidiary of the Bell System, arguably the most innovative industrial laboratory in the world at the time," academics estimate (PDF). Bell was forbidden from competing outside telecomms. Taplin saw history repeated with IBM. Under the 1956 (again) consent decree IBM was obliged to unbundle software from hardware in the 1960s. But competition authorities again opened up an investigation in 1969 which ran for 13 years. Caution made IBM ensure its first microcomputer, the IBM PC, launched in 1981, was an open platform. 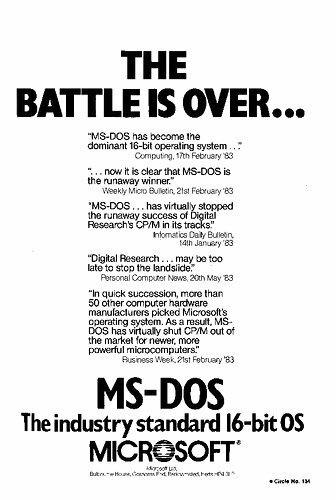 IBM chose three operating systems to run on the first PC but clearly favoured an outsider, from a tiny Seattle outfit originally called "Micro-Soft". Then Microsoft got the treatment. "Every 20 years we have this fight – and we're about to have it again," Taplin told the audience. He elaborated. Antitrust was necessary "not because they're too big, but because there's no market solution" to Google and Facebook. The barriers to entry are now so high nobody is going bust open the ad duopoly. This is the point made by Oracle in its European complaint. Effective behavioural advertising requires hods of data, and nobody can gather sufficient data enough to compete against Google's "superprofiles", or Facebook's Graph in behavioural advertising. Google enjoys market dominance in several markets with a billion-plus user base including video, mobile operating systems, maps, email, web analytics as well as search. And add Chrome, which has almost 60 per cent of desktop and mobile. Taplin cited Snapchat an example of a company that tried to innovate, but refused to take Facebook's buyout offer. Facebook has simply copied its features. "There may be interim solutions," Taplin said, short of a breakup. Missouri has filed the first competition lawsuit against Google in four years. The Trump era is more hostile to corporate mega-mergers than previous Republican administrations; remember that it was under Reagan that the IBM antitrust probe was killed in 1982, and under Bush II, the Microsoft litigation was rapidly settled. The DoJ has filed suit to block AT&T and Time-Warner pairing up. Not everyone agreed with Taplin's remedy. There are revenue streams other than advertising, I pointed out talking to Jonathan later. They maintain their monopoly so fiercely because they're happy being a big fish in a small pond – and fight to keep the larger pond of transactions and bundles at bay. The third guy behind Micro-Soft, who you may not know about, chatted to us here about Bill's early code skillz.